Atend a PCA Regional or National to see them!! and dignity peculiar to himself. height in excess of 10 inches. 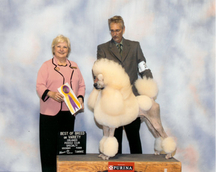 Any Poodle which is over 15 inches or is 10 inches or less at the highest point of the shoulders shall be disqualified from compitition as a Miniature Poodle. The Toy Poodle is 10 inches or under at the highest point of the shoulders. Any Poodle which is more than 10 inches at the highest point of the shoulders shall be disqualified from compitition as a Toy Poodle . As long as the Toy Poodle is definitely a Toy Poodle and the Miniature Poodle a Miniature Poodle, both in balance and proportion for the Variety, diminutiveness shall be the deciding factor when all point are equal. PROPORTION: To insure the desirable squarely built apprearance, the length of the body measured from the breastbone to the piont of the rump approximates the height from the highest point of the shoulders to the ground. SUBSTANCE: Bone and muscle of both the forelegs and hindlegs are in proportionto size of dog. 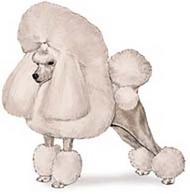 These are marketing terminologies to sell Poodles for more money. In fact these are not the norm.